Newly crowned EBU heavyweight champion Kubrat Pulev (23-1) now have big Pole Mariusz Wach (32-2) as official challenger. The parties have a period for private negotiations before a date for purse bids are set. 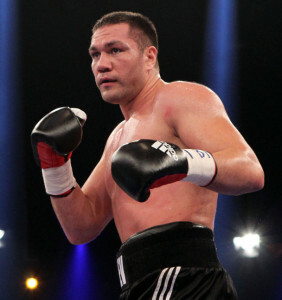 Pulev (pictured), promoted by Sauerland Event, also won an IBF eliminator when he beat Dereck Chisora May 7 in Hamburg and is ranked # 2 by the IBF so there might be bigger fights on the horizon than a mandatory defence of the EBU title. Former World title challenger Enad Licina (30-4) continues his way back July 15 in Munich on a show promoted by Petko's Box Promotion. Topping the bill is superlight Howik Bebraham (3-0) in a defence of the International German title against Robert Tlatlik (18-0). Also on the bill are the Kraft Brothers, James and Toni. James, a cruiserweight is 8-0, and Toni, a lightheavy is 7-0. Petko's Box Promotion is headed by semi retired heavyweight Aleksander Petkovic. Former IBF superbantam champ Kiko Martinez (35-7) headline a show in Benidorm (Spain) July 23. This is Martinez first fight since losing to Leo Santa Cruz. Superwelter Roberto ”El Tigre de Benidorm” Santos (24-9-3) is featured on the undercard. Opponents for both are to be announced.